Custom Building Contractor, Service Construction Company Inc. has been building some of the finest new custom homes, log homes, churches and custom modular homes in eastern Pennsylvania for over 30 years. Pocono PA. New Home Construction - From lot clearing and foundations to the finish carpentry, this team of professional contractors have built some of the finest homes in eastern Pennsylvania. 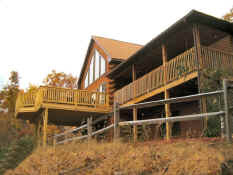 Custom Log Home Builders Lehigh Valley Poconos, PA. - Accomplished Log Home and Timber Frame Builders, this Pocono area construction company has built a solid reputation for constructing some of the finest log homes in Pennsylvania. From basic log cabin homes which they sell as a Crockett Log Home dealer, that can then be custom built to your desires, to custom crafted timber frame homes, Service Construction Company Inc. can create the home of your dreams. 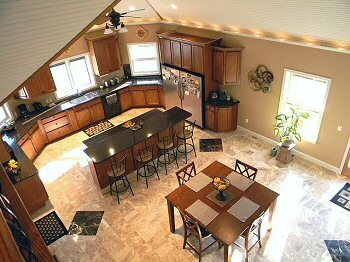 Custom kitchen construction and extensive home remodeling in this home above the Lehigh Valley of PA. Featured are all wood painted vanilla cream with pewter glaze cabinets with Cambria Wilshire Red countertops. Church construction from planning and design and from foundation to finish. Office Buildings to Retail Store Construction, this team of dedicated professionals have the years of experience to bring your project in on time and budget. 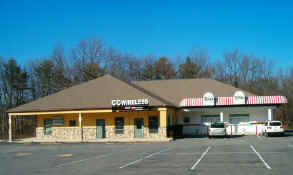 Steel Building sales and installation through all of Eastern Pennsylvania. Serving all of Eastern Pennsylvania from Carbon County to Monroe County and Pike County and known throughout the Poconos as a premium quality builder and contractor, Service Construction Company Inc. is ready to meet your needs and exceed your expectations.